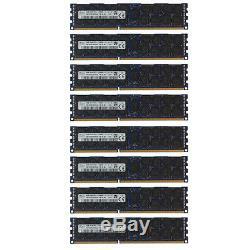 128GB Kit 8x 16GB DELL POWEREDGE T410 T610 R610 R710 R715 R810 R720xd Memory Ram. Hover over the Thumbnail to enlarge. DELL POWEREDGE T410 T610 R610 R710 R715 R810 R720xd. These are all New Condition modules with original HP or Dell labels. These are all ECC Registered Modules! These are mainly for servers and will only work in a small fraction of desktops and workstations! PLEASE DOUBLE CHECK SYSTEM COMPATIBILITY! ECC Registered DIMMs & ECC UDIMMS can not be mixed. If your system came with ECC UDIMMs then use of registered DIMMs will require the removal of all existing UDIMMs. A-Tech is one of the most trusted names in Premium Memory. A-Tech modules are rigorously tested to ensure that your memory meets our stringent compatibility and performance standards. Every A-Tech ram module is tested for complete functionality before it leaves our doors. Give your computer the best, trust A-Tech! We look forward to working with you and hope that you give your computer the best, and trust A-Tech! At A-Tech, customers come first. The only difference is the current listing is 12800 1.35V instead of 12800 1.5V or 10600 1.35V. 12800 1.5V is same performance with slightly higher power consumption at a lower price. 10600 1.35V operates slightly slower, with equal power conservation at a lower price. 1.5V PC3-12800 8x16GB DELL POWEREDGE T410 T610 R610 R710 R715 R810 R720xd Memory Ram This product is designed for customers who want the best performance for their computing environment and the best deal. Take a look into this special offer or the other ones marked below to see the opportunities that A-Tech has in store for you! 1.35V PC3L-10600 8x16GB DELL POWEREDGE T410 T610 R610 R710 R715 R810 R720xd Memory Ram This product is designed for people who want the best deal upgrading their systems and also want the best power conservation, but not necessarily the best performance. Take a look into this special offer or the other ones marked below to see that opportunities that A-Tech has in store for you! 4GB DELL POWEREDGE T410 T610 R610 R710 R715 R810 R720xd Memory Ram. 16GB Kit 4x 4GB DELL POWEREDGE T410 T610 R610 R710 R715 R810 R720xd Memory Ram. 32GB Kit 8x 4GB DELL POWEREDGE T410 T610 R610 R710 R715 R810 R720xd Memory Ram. 8GB DELL POWEREDGE T410 T610 R610 R710 R715 R810 R720xd Memory Ram. 32GB Kit 4x 8GB DELL POWEREDGE T410 T610 R610 R710 R715 R810 R720xd Memory Ram. 64GB Kit 8x 8GB DELL POWEREDGE T410 T610 R610 R710 R715 R810 R720xd Memory Ram. PC3-12800 1.35V 16GB DELL POWEREDGE T410 T610 R610 R710 R715 R810 R720xd Memory Ram. PC3-12800 1.35V 64GB Kit 4x 16GB DELL POWEREDGE T410 T610 R610 R710 R715 R810 R720xd Memory Ram. PC3-12800 1.35V 128GB Kit 8x 16GB DELL POWEREDGE T410 T610 R610 R710 R715 R810 R720xd Memory Ram. The item "128GB Kit 8x 16GB DELL POWEREDGE T410 T610 R610 R710 R715 R810 R720xd Memory Ram" is in sale since Wednesday, November 4, 2015. This item is in the category "Computers/Tablets & Networking\Computer Components & Parts\Memory (RAM)".